was ready to fly to Harare for the signing. Zanu-PF party had made a fair election impossible. sanctions imposed by Western countries to end his iron grip on power. July needed $13.8 trillion to buy basic commodities. $720 billion up from $300 billion. prices using a coupon system. Robertson, a private economic consultant said. and unemployment above 80 percent. continued to hike prices without justification. document unless certain conditions were met. met," said a foreign diplomat based in Harare, who did not want to be named. also been expected to be present. Mugabe's party or government were far from commencing. yet we have not heard condemnation of these acts," Tsvangirai told the BBC. incompetent or inadequately funded black farmers. by Brett D. Schaefer and John J. Tkacik, Jr.
For decades, China has been a stalwart ally of Robert Mugabe. This relationship began in the 1970s, when China armed Mugabe's Zimbabwe African National Union (ZANU) guerrillas against white rule in Southern Rhodesia. Subsequently, it was no surprise when China and Russia vetoed a July 12 United Nations Security Council resolution to sanction Mugabe and key figures in his government for their role in unleashing a campaign of violence and intimidation that forced opposition presidential candidate Morgan Tsvangarai to withdraw from last month's Zimbabwean run-off election. This incident is only the most recent example of the detrimental role China plays in Africa—and elsewhere—as the protector of despots and enabler of repression. With the 2008 Olympic Games on the horizon, the U.S. should not ignore what is a clear and dangerous trend. In March, Zimbabwe held presidential and parliamentary elections. Opposition candidates won a majority of parliamentary seats, and opposition candidate Morgan Tsvangirai of the Movement for Democratic Change won a plurality of votes, thus forcing a run-off election for president against Mugabe. The results of the March election were shocking blows to Mugabe and his Zimbabwe African National Union-Patriotic Front (ZANU-PF) supporters. Determined to win the run-off election, Mugabe and the ZANU-PF launched a three-month campaign of intimidation that saw over 100 opposition supporters killed, thousands injured, and widespread destruction of property. As a result of this violence, Tsvangirai withdraw from the election. Without an opponent and continuing to intimidate voters, Mugabe won the June 27 run-off election with over 85 percent of the vote. China, it seems, may have played a major role in Mugabe's decision to hold onto power. According to The Washington Post, when Mugabe lost re-election on March 29, he believed he was defeated. But when he told his top security officials that he planned to step down, Zimbabwe's army chief General Constantine Chiwenga insisted that he would conduct a "military-style campaign against the opposition" that would ensure Mugabe remained in power. In order to conduct such a "campaign," the Zimbabwean military needed to ensure that its stocks of weapons and ammunition were sustainable. Considerable circumstantial evidence indicates that Mugabe and Chiwenga turned to China for precisely such a campaign donation. Such assistance would hardly be unprecedented; China has always supported Mugabe as an indirect means of opposing the United States. For instance, according to George Washington University scholar David Shinn, China began selling J-7 fighter jets and radar to Zimbabwe in 1989. As recently as 2005, Zimbabwe's air force received six K-8 jet trainers from China as well as shortwave radio jamming equipment, which Mugabe uses to disrupt Voice of America broadcasts.In return for the weapons necessary to sustain Mugabe's violent regime, Shinn notes that Zimbabwe reportedly promised China "access to its mineral wealth." Thus, when Zimbabwe called for help, Chinese assistance arrived in short order. On April 16, several sources reported uniformed Chinese military personnel, wearing side arms, had arrived in the city of Mutare, a stronghold of support for Morgan Tsvangirai. These reports also noted that the Chinese were accompanied by 70 senior Zimbabwean army officers. That same day, a Chinese arms ship, the An Yue Jiang, attempted to offload a large cargo of small arms and ammunition for the Zimbabwe military at the South African port of Durban, but the ship was boycotted by South African longshoremen and subsequently forced to seek a friendlier port. Eight days later, with the An Yue Jiang still unable to offload its cargo, the Chinese foreign ministry spokesperson announced that the Chinese shipper (China Ocean Shipping Company—COSCO) "has decided to recall the ship." However, by April 27, Jane's Defense Weekly had reported the An Yue Jiang had docked at Luanda, Angola. Finally, on May 6, Zimbabwe's information minister declared that the Chinese arms shipment was already in Zimbabwe. Yet, roughly three weeks later, on May 26, a Chinese foreign ministry spokesman termed such reports a "groundless fabrication" and insisted that the "relevant military goods will be shipped back with the ‘An Yue Jiang' which is now on its way home." And a month after that, the foreign ministry would only confirm that "the An Yue Jiang has already returned to China," without mentioning the ultimate disposition of its cargo. Nonetheless, on June 5, Deputy Assistant Secretary of State Thomas Christensen told the Senate that "it's our understanding that that shipment of arms sales—that shipment of arms, which is over $1 million, we believe, in arms—was sent back to China." Although Christensen attributed the recall as a response to concerns voiced by the international community, the U.S. government has been unable to verify the Chinese foreign ministry's statement that the cargo had, in fact, returned to China with the An Yue Jiang. Regardless of whether the An Yue Jiang shipment arrived in Zimbabwe, one crucial fact remains undeniable: Robert Mugabe's Chinese-armed military machine was responsible for the tsunami of violence that engulfed the run-off presidential election "campaign." As a result of the electoral violence, the United States and the European Union urged that the balloting be postponed. The Chinese government, however, declared its hope "for a smooth completion of the work of the presidential election, and the restoration of the country's stability and development as soon as possible (jin kuai)." Clearly, the Chinese government's intention was to get the Zimbabwe voting over quickly—and Mugabe re-elected—intending that controversy would dissipate by the opening of the Beijing Olympics. Despite a boycott by the opposition, the "run-off" election was held on June 27 and, of course, Mugabe won with over 85 percent of the vote. The U.S., Europe and most of the African Union countries declared Mugabe's win illegitimate. But not China. Indeed, by July 12, China—along with Russia—had vetoed a U.N. Security Council draft resolution on Zimbabwe, claiming that an African Union "mediation effort" had not had "enough time." The Washington Times reported that an emboldened Mugabe now plans new "elections" to reverse the majority in parliament that Tsvangirai's party won in March. China's status as a major economic power renders it impervious to any trade, financial or economic sanctions the United States could possibly inflict upon it. In fact, such sanctions would constitute "mutual assured economic destruction." But there is no need for the world's democracies to avert their eyes and pretend that China is, somehow, a "responsible stakeholder" in the international effort to protect human rights. As such, the United States has very few diplomatic tools capable of inducing China to restrain its over-enthusiastic support for dictatorship and repression around the world. The President could have used ambiguity regarding his attendance at the Olympic opening ceremony to good advantage three months ago in the aftermath of the tragedy in Tibet. By failing to do so, he has virtually assured a self-fulfilling prophecy: Cancelling his attendance will indeed insult his hosts. But the damage the President will do to American principles by attending a full-throated celebration of China's power—unleavened with justice or mercy—is worse than a breach of diplomatic protocol. The President suddenly discovering that he has other business to attend to in Washington can still send a message to China's communist leaders, to the Chinese people, and to our friends around the world that America still stands for the principles of liberty and freedom. Such an announcement is the only option the President has left. Brett D. Schaefer is Jay Kingham Fellow in International Regulatory Affairs in the Margaret Thatcher Center for Freedom, a division of the Kathryn and Shelby Cullom Davis Institute for International Studies, and John J. Tkacik, Jr., is Senior Research Fellow in China, Taiwan, and Mongolia Policy in the Asian Studies Center at The Heritage Foundation. For some history of China's involvement in Zimbabwe, see also Abraham McLaughlin, "A rising China counters US clout in Africa, Trade drives political role ahead of Zimbabwe's election," The Christian Science Monitor, March 30, 2005, at http://www.csmonitor.com/2005/0330/p01s01-woaf.html (July 16, 2008). Violet Gonda, "Zimbabwe government jams radio stations," SW Radio Africa, June 27, 2006, at http://www.swradioafrica.com/news270606/jam270606.htm (July 16, 2008). David H. Shinn, "Africa and China's Global Activism," a paper presented at a National Defense University Pacific Symposium on "China's Global Activism: Implications for U.S. Security Interests," June 20, 2006, at http://www.ndu.edu/inss/symposia/pacific2006/shinnpaper.pdf (July 16, 2008). David Baxter, "Armed Chinese soldiers police Mutare Streets," Association of Zimbabwe Journalists, April, 15, 2008, at http://www.zimbabwejournalists.com/story.php?art_id=3944&cat=2 (July 16, 2008).. See also blog reports at http://www.sokwanele.com/thisiszimbabwe/archives/867 (July 16, 2008). A total of six containers weighing 77 tons on the Chinese vessel An Yue Jiang reportedly contained 3 million rounds of ammunition for AK-47 rifles, 1,500 rocket propelled grenades, and 3,500 mortar bombs, according to Russell Hsiao, "Chinese Soliders and Arms Exports Embroiled in Zimbabwe's Electoral Impasse," Jamestown Foundation China Brief, April 29, 2008, at http://www.jamestown.org/china_brief/article.php?articleid=2374129 (July 16, 2008). Celia W. Dugger and David Barboza, "China says it may recall Zimbabwe arms shipment," International Herald Tribune, April 22, 2008, at http://www.iht.com/articles/2008/04/22/africa/arms.php (July 16, 2008). Foreign Ministry Spokesperson Jiang Yu's Regular Press Conference on April 24, 2008, at http://www.fmprc.gov.cn/eng/xwfw/s2510/2511/t429018.htm (July 16, 2008). Helmoed-Römer Heitman, "Chinese ship with Zimbabwe munitions sails to Luanda," Jane's Defense Weekly, May 1, 2008, at http://www.janes.com/extract/jdw2008/jdw36518.html (July 16, 2008). Lance Guma, "Zimbabwe: Minister Claims Controversial Chinese Arms Now in Country," SW Radio Africa (London), May 6, 2008, at http://allafrica.com/stories/200805061078.html (July 16, 2008). "Foreign Ministry Spokesperson Qin Gang's Remarks on the Untrue Report about the ‘Anyuejiang' Cargo Ship," Ministry of Foreign Affairs, People's Republic of China, May 26, 2008, at http://www.fmprc.gov.cn/eng/xwfw/s2510/t440463.htm (July 16, 2008). Mugabe to call for more elections? Change (MDC) loses its current majority in Parliament. leaked the information, and spoke on condition of anonymity. MDC says the figure is closer to 500.
with the MDC as junior partner." power to order a fresh poll. provide a sufficient margin for Zanu(PF). within the politburo to regain their parliamentary majority "by any means." another vote on their terms," he told Hill. power by terrorising the population." documents from sources within ZANU-PF laying out strategy for "no go areas"
United States because of their links to Mugabe. not been recognized by the Mugabe junta. political crisis. Mr. Mbeki came under sharp criticism last week from U.S.
reports from the State Department. vetoed by Russia and China. for political repression in connection with Mr. Mugabe's recent re-election. as he used violent means against the opposition. trends in his own country on the issue. accused of being soft on the Mugabe government. leadership after the failure of the draft U.N resolution. Zimbabweans are respected, and reflected in their government. Harare feels a bit like the circus has just packed up and left town. The militia roadblocks and base camps have disappeared from most (but not all) areas, posters have come down from public transport vehicles, teenagers are back to wearing T-shirts with the faces of R&B stars rather than that of R G Mugabe. We were all so focused on 29 March, then on being kept waiting for 5 weeks for a result, then on 27 June, the AU summit, then the G8 summit, and then the UN Security Council meeting. To the ordinary person with no knowledge of "Diplomatese" nothing seems to have come out of that. So after weeks of soaring hopes and giddy visions of a bright future, we have all had to come back down to earth, and resume our normal lives. Now everyone's biggest headache is how to make money. Being formally employed means you take home only half of what you actually earn - income tax, or Pay As You Earn as we call it here, is a whopping 47.5%. Add the obligatory social security tax, the pension scheme and health insurance, and you have probably the highest taxed worker in the world. So quite a number of people have started jetting off to the Middle East, UAE, and all over Africa to buy goods for resale. Anything goes - clothing, footwear, hair extensions & products, electronics, cellphones, and even groceries. Supermarket shelves are bare again, so business is brisk. And at least all your earnings are yours - you don't have to share them with the government. Nothing has changed, inflation gallops on. It always amuses me when broadcasters on international business programmes make a big deal of inflation hitting 3%, 5% etc in some economies. Ours is off the charts, and people worry about 5%. A neighbour of ours gave their gardener some days off and enough money to go to and from his rural home during the break. 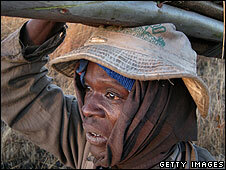 The gardener then sent word that he could not come back to work as bus fares had doubled in the week that he was away. Budgeting is a foreign word to young people entering the job market now. For one's personal finances, it's a matter of buying whatever you need (if you can afford it), then hoping for the best until the next pay day. So our days of being political analysts seem to be over, at least for now. Our focus has shifted back to whether it pays to invest in the local stock exchange and where to get maize meal, bread, salt, sugar and cooking oil. in by Tuesday, July 15. No dates have been announced for the swearing-in of MPs and Senators. non-compliance with the deadline are not spelled out in the Constitution." would also comprise the president and deputy of the Council of Chiefs. the Senators would be appointed by Mugabe. foreign currency in the Alpine country, it was established this week. search high and low for any assets held by those close to the Mugabe regime. with little progress noted so far. of the 15 Security Council members who supported the bid. world, to see what we might do to keep the focus on the issue of Zimbabwe." for inspection and to identify any assets held by Mugabe and his cronies. and the probe was continuing. were underway to expose such cases. targeted Zimbabweans to hide some money or to export it out of that country. officials are on the list. elections and the sham June 27 run-off. the inter-party talks taking place under President Thabo Mbeki's mediation. expressed in the March 29 elections," an NCA spokesperson said. sections of leadership plan to impose a leader on the Zimbabwean people. advocates respect for people's wishes," the spokesperson said. democracy when the result of the June 27 elections was clearly illegitimate. ordinary citizens to be heard. freedoms that can be expected in a democracy. continued mis-governance and the lining of its members' own pockets. light of the Washington Times story which we carry on the front page today? country's resources, which has lead to our economic meltdown. ruthless than even the Zanu (PF) militia. respects the fundamental freedoms of individuals. The State President made it clear that he would not accept defeat even if he lost the elections. The government stops violence and allow local observers that were accredited for the March 29, 2008 Harmonised Elections to observe the Presidential Run Off. The current composition and structure of negotiations should stick to the parties of the 27th June Presidential elections, that is, Zanu PF's Robert Mugabe and MDC's Morgan Tsvangirai. The current mediator in the talks, South African President Thabo Mbeki is part-time and has been leading the negotiations on Zimbabwe for a long time without much success is perceived as sympathetic to the ruling Zanu PF. The talks are concentrated on the issue of power sharing and Government of National Unity (GNU) at the exclusion of other options. A Government of National Unity is a subversion of our National Constitution and only a Neutral Transitional Authority should be put in place with a mandate to take Zimbabwe to fresh, free and fair elections that will hopefully not be disputed by the parties. in a book at an appropriate time. they were done in Zimbabwe. take away Mugabe" (The New Vision, June 28). about Morgan Tsvangirai's leadership abilities. animals in the bush if they must have meat! public opinion even with in SADC. this region over the last four years. work and support whoever family member failed to cross over from home"
nerve to stand the heat of the moment when required. involvement would backfire even in the shorter term. Zimbabwe yesteryear. But he is more urgently needed today. (incidentally, not 1994 Rwanda!) in the making. of chaos from one African country to another. Dr Nikamara is an East African Development Economist working in SADC region. calling for the government to allow Zimbabwean refugees to work in the UK. It's great to see you all. speak. Thank God for it. "I condemn those orchestrating the latest horrific escalation of violence. investigation of the human rights abuses." 60 years ago, the Universal Declaration of Human Rights was published. Without work exiles here are falling into destitution. taken refuge from an oppressive and cruel regime. I welcome the government's commitment for no forced return for Zimbabweans. Free Zimbabweans in detention, who can't go home. And if they stay here, they must not stay in limbo. they have much to contribute. Vanity asks the question, "Is it popular?" the reconstruction of their country. We are here to say, 'Restore Zim'. 'Restore Zim'. international support, Zim can rise again. I know our Prime Minister wants that. He has pledged support for that day. And remember that anyone who comes to Equity must come with clean hands. incarcerated in inhuman conditions or left in limbo. 1. If detainees are not going to be deported, please release them NOW. them conditional permission to work now. 3. Please give them your support now. And for us ­ may all our communities engage with Restore Zim. Give your donations for Restore Zim to Tesco's Bank. Join us in this civil coalition. council resolution" (China and Russia veto Zimbabwe sanctions, July 12). change of heart regarding its position on Zimbabwe after the G8 summit. becomes apparent that this was never the case. Russia has been consistent from the beginning on its position over Zimbabwe. will of the Zimbabwean people. sham elections and political violence in Zimbabwe. back efforts to lift Africa out of poverty. try to boost productivity and incomes without harming the environment. to help them take on the risks associated with expanding their enterprises. freedom from hunger," he said. Grameen Bank, the pioneering micro-credit institution. South African border, leading to the possible deportation of refugees. killings and beatings and have brutal injuries all over their bodies. were could only interview some five percent. arrivals consist of families fleeing political violence. project director in the northern border town of Mahkado in Limpopo province. helped more than 200 Zimbabweans a day. fences and random police controls. also sought refuge in other countries. 27 run-off, when Robert Mugabe snatched back power. England, is said to have claimed political asylum in the past four months. His father is senior assistant commissioner Chihobvu. Chihobvu junior is believed to have arrived in England last year. in Mugabe's war with the people. drastic, calling the vote "a failure for the security council". somehow convince the clearly deranged Robert Mugabe to change his ways. against politics and venality, it is hardly surprising that morality loses. acquiescence of Russia, China and others. would eventually come into the fold. still there, and in the case of Iran, stronger than ever. and development should always take priority over democracy and liberalism. the increasingly powerful non-democratic world. little hope of international rescue from their own leaders. the west's declining influence on the world stage"
rule of law, human rights or even limited levels of morality. would help drag states to some semblence of democracy. kindly behave themselves I suppose - that's bound to work. Mail, on a bad day. itself. The barbarians are at the gates. Africa at the center again. liberal becuase other large countries were poor. Now they are not (so) poor. The contradictions were bound to emerge. One small issue of disagreement. The UN has ALWAYS been a waste of money. aimed at the U.S. for foreign intrusions and "pushing our ways onto others." them. Now South Africa catches flak for just wanting to talk. So China can veto action on Zimbabwe and "that's just the way it is,"
the UN think if we didn't? actions over the environment as well. understand the different realities and requirements of Russia and China. when they insist on respect for human rights. failure worth keeping, the rest should be left to crumble to dust. in Zimbabwe will just have to be understanding about it. in the west engage in as nefastus alluded to. proof that multilateral action outside the UNSC can work very well. support a potentially embarrassing and regressive African presidency." campaign" for their defeat. Last year, a similar fate fell upon Belarus. legal or other means to secure a goal. western governments could lead the charge for intervention in Somali.."
The US and British are intervening in Somalia. The Ethiopian invasion? Brown and Milband getting in stew, bloody hypocrites. seat on the Security council. Why would the US form a G3 council with Japan? Chinese Ambassador to the UN Wang Guangya said Thursday. " So Mugabe is this month's "deranged dictator" is he? We're getting through them very quickly these days aren't we? all of them have in common is a refusal to follow orders from Washington. Ruanda (whose names escape me) . that his name? )from Somalia Plus the Burmese junta. what he was told by Washington. Not a very attractive lot ? the men who run Uganda and Ruand. Morocco. Take Le Cote d'Ivoire. Hello King Hussein of Jordan! I do believe this list is even longer!! burden involved in having fair skin and believing in democracy. "We" think the world is illiberal. And "they" think that "we" are a bunch of hypocrites. Why don't we put it to a vote? records over the past couple of decades? violantion of the forth geneva convention and multiple UN resolutions. business with, as long as they are aligned. point. What is happening in the world only seems to confirm this. sanctions on the 14 members of the Mugabe regime. the outcome of 'talks' between the country's political rivals. Zimbabwe, and interfere with attempts to form a national unity government. This was the same excuse used by the Zimbabwean government. itself an enormously important development," Raftopoulos said. opposition makes the right kind of demands. The talks between the political parties are shrouded in secrecy. the height of the southern hemisphere winter. collector, Zimbabwe Revenue Authority, ZimRA. subdue resistance from the residents. Chombo, "to stop this senseless and inhumane eviction." due process should have been followed." Airport road is a public relations disaster for the government. Efforts to obtain comment from ZimRA boss Gershom Pasi were futile. Subject: For Godsakes, respect us. association, too.) i treat newspapers with suspicion. would write, if i got rest one day. killed handfulls, and his fury has been on record for devouring thousands. meantime, i am sure the world, and myself still deserve the nemesis of r.g. we should not trust in horses, for they are many.